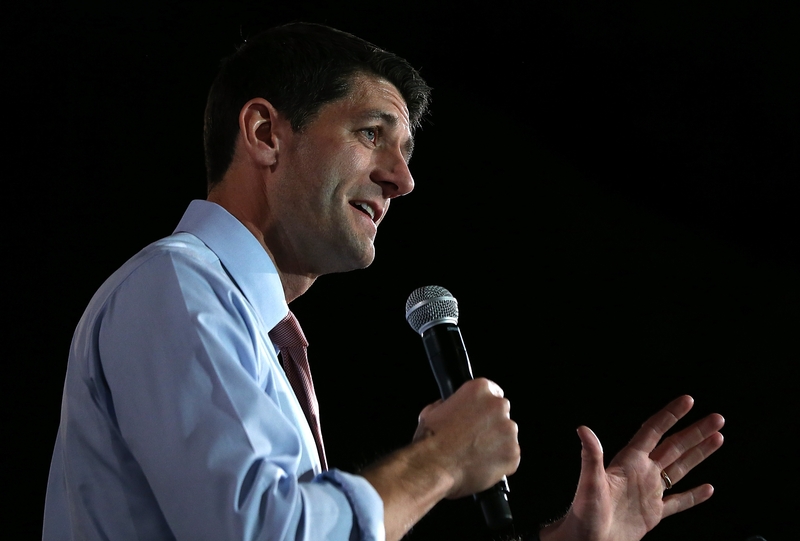 Rep. Paul Ryan, R-Wis., suggested today that House Republicans could push for a short-term increase of the debt limit, likely around one month, to allow more time for Republicans to work with President Obama and Senate Democrats on spending cuts. "We're discussing the possible virtue of a short-term debt limit extension so that we have a better chance of getting the Senate and the White House involved in discussions in March," Ryan, the chairman of the House Budget Committee, told reporters at the House Republican Conference annual retreat in Williamsburg, Va.
"Because what we want to achieve at the end of the day is a two-way discussion between Democrats and Republicans, and out of that hopefully some progress being made on getting this deficit and debt under control." Treasury Secretary Timothy Geithner has informed Congress that the U.S. is expected to hit its current debt limit of $16.4 trillion by mid-February or March. Obama: Not raising debt limit "absurd", "financial disaster"
A one-month extension would take the debt limit fight to around the same time as both across the board spending cuts are set to go into effect and when current funding of for the government expires. The triple threat in March of possible default on the nation's debt, a possible government shutdown and billions in looming across the board spending cuts could give Republicans great leverage in negotiations with Democrats, but Ryan said at this time "all options are on the table." What is clear, is that Republicans are determined to secure substantial spending cuts and deficit reduction in upcoming negotiations. "We think the worst thing for the economy is for this Congress and this Administration to do nothing to get our debt and deficits under control" Ryan said. "It would be wrong if we walk out of this spring with no achievement on debt reduction whatsoever because that will hurt the country, that will hurt the economy." Republican leaders are trying to build consensus for whatever way they move forward on these fiscal issues trying to avoid a repeat of the fiscal cliff debate that revealed a divided conference, even among leadership. House Speaker John Boehner, R-Ohio, voted for the final "fiscal cliff" package that included tax rate increases and no spending cuts, as did Ryan, and Majority Leader Eric Cantor, R-Va., and Majority Whip Kevin McCarthy, R-Calif., opposed the package. Boehner has already said he will demand spending cuts of equal or greater value to any debt limit increase. At the GOP retreat, leaders like Ryan and Ways and Means Chairman Dave Camp, R-Mich., are also trying to make sure rank-and-file Republicans, some who do not believe there will be economic consequences if they refuse to raise the debt ceiling, understand the repercussions that come with each choice they have to make in the upcoming deficit fights. "Our goal is to make sure our members understand all the deadlines that are coming" Ryan said. "All the consequences of those deadlines that are coming in order so that we can make a better informed decision of how to move and how to proceed." Ryan also said Republicans "have to also recognize the realities of divided government that we have."